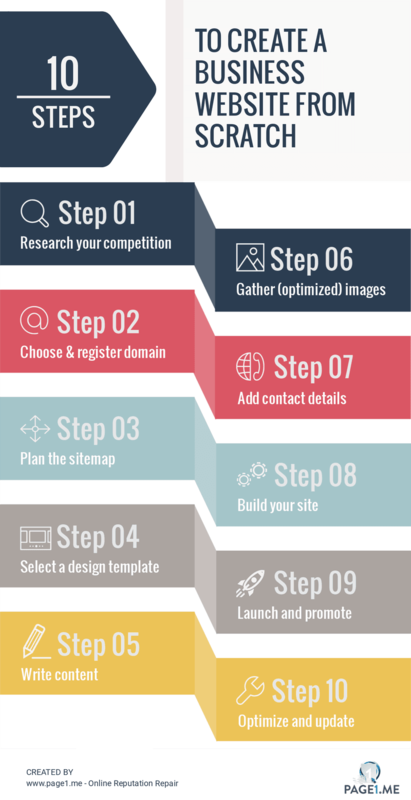 Setting up a business website is far easier than you may think when following our ten simple steps. Researching your competition and preparing a plan for your website is crucial. Without a website, you’re losing out on potential customers. You might think it’s too complicated or too expensive to make a website from scratch but not anymore. These days it’s easy to get online and connect with new online customers across the country and world. If you need a site but it seems like a daunting step, simply follow these steps. It’s easier than you think to make a website from scratch, all you need is a proper plan. Find out what makes your competition successful, research their website as a customer would. What did you like about it? Was it easy to find what you were looking for? Use your competitions’ success and mistakes as key points to stand out with your own website and make your site as user-friendly as possible. Domain names are important for Google and other search engines: include descriptive keywords – such as the type of business or location – to make it easier for customers to find you using search engines. Your domain name should be easy to remember: avoid punctuation like dashes and take a name that’s easy to pronounce, therefore easy to remember and write. Consider including your location: For example, a business called Smith Electrician based in Albany, NY, could opt for www. smithelectricianalbany. com. This may help Google to rank your site higher when customers are looking for a service in their city. As soon as you chose a domain name, register your domain on GoDaddy or BlueHost. These are mainstream domain registers where you can also include hosting as well as a business email address. But there are many other’s out there that will suit your need just as much. Homepage: Display your name, what you do and where you are located. Sell your business and your services. Products / Services page: Show people what you offer, spend one to five sentences describing each product or service and pricing. Contact page: to tell people how to reach you or where to find you. See step 7 for more details. Unless you want something very specific and complicated, there is no need for developers and complicated coding. There are so many beautiful and efficient pre-built templates on the market. ThemeForest has a template library where you can search a template through categories. If you want to keep control over your website and update your site yourself instead of paying someone to do it, I’d recommend Divi Builder. Divi has many default templates and beautiful pre-built templates that fit most needs. With the Divi builder, you can customize your site yourself. There is no need for coding, simply drag and drop site elements. Prior to writing your website content, perform keyword research. Find out which keywords your potential customers are searching for on Google and optimize accordingly. The use of images can be either very powerful or detrimental to your website. We recommend to avoid stock images but rather use less high-quality images that are made by yourself or a photographer. And more importantly, don’t forget to SEO optimize your images to help Google find your site for the keywords you want to be found for. Besides listing your business’ phone number and email address, you might consider embedding a Google maps to display your location. This may increase the chance for your business to rank in Google Maps but also makes it as easy as possible for customers to find directions to your location. If you want users to shop online or subscribe, keep sign-up or inquiries process as quick and easy as possible. Note: Google prefers sites with an “appropriate amount of contact information”. Especially contact information that matches the whois data. If you chose a template design – as we mentioned in step 4 – it's very easy to build your website. If you don’t have the time to build the site yourself, consider hiring a professional to build your website. There are many cheap experienced website builders available on Upwork or Fiverr who will build your site for around $10-$20 per hour. If you choose to let someone build your site make sure to ALWAYS GET ACCESS to your site. Ask login details for everything. The last thing you want is to be locked out when the site is ready and having to pay for every little adjustment. Once your site is ready, advertise your website details through your marketing and social media channels to let everyone know! To stay relevant for customers as well as Google and other search engines, you need to update your site regularly. Keep SEO optimizing your website through uploading blogs and promoting your site through marketing. With a proper website, you not only rail in potential customers, but it also protects your online reputation. Good luck!